Phytomyza cirsii Hendel, 1923a; Spencer, 1976. Fauna ent. Scand. 5(1): 404-5, figs 647B, 707. Phytomyza cirsii Hendel, 1923a; Spencer, 1990. Host specialization in the World Agromyzidae (Diptera) : 251, 255, 256 (fig. 957), 259. 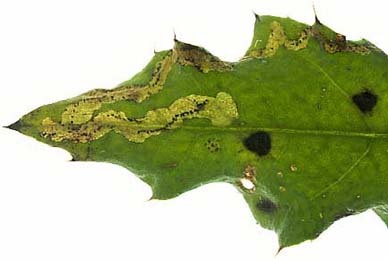 Leaf-mine: A shallow, upper surface, whitish linear mine. 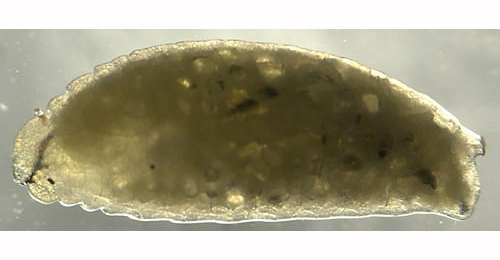 Pupation external (Spencer, 1972b: 72 (fig. 233A), 77). Black; posterior spiracles each with an ellipse of up to 26 minute bulbs (Spencer, 1972b: 77). Time of year - mines: June-August, October. Distribution in Great Britain and Ireland: Widespread, probably not uncommon but overlooked. London (Hampstead), Suffolk (Flatford) (Spencer, 1972b: 77), Warwickshire (Keresley) (Robbins, 1991: 121); Cambridgeshire, East Suffolk, Glamorgan, Haddington, Huntingdonshire, Leicestershire, Meriontheshire, North Somerset, Shropshire, South Lancashire, South-west Yorkshire, Stafford, West Gloucestershire, West Suffolk and Worcestershire (NBN Atlas). Also recorded in the Republic of Ireland: Co. Clare (the Burren) (Spencer, 1972b: 77). Distribution elsewhere: Widespread and common in much of Europe including Denmark, Finland, Sweden (Spencer, 1976: 405), The Netherlands (Bladmineerders van Europa), Belgium (Scheirs, de Bruyn and von Tschirnhaus, 1996), Germany (Spencer, 1976: 570), Austria, Czech Republic, European Turkey, French mainland, Lithuania, Poland and Spanish mainland (Martinez in Fauna Europaea).